Magnificent in its pure, untouched state, this side chair is a stunning survival of eighteenth-century Philadelphia furniture. For at least a hundred years if not its whole life, the chair has remained in the same Pennsylvania family and most recently has stood unobtrusively in an entry way collecting mail while giving little indication of its lofty beginnings. Such fortuitous "benign neglect" over its lifetime has helped maintain this recently discovered 250-year old chair in an outstanding state of preservation. Its surface is “in the black” fully revealing the crispness of the pronounced carving and its slip-seat bears the original leather upholstery. Neatly folded over the incurvate compass-shaped slip-seat frame, the leather is meticulously affixed with 56 hand-forged nails to the underside of the frame along the front and sides and to the rear edge of the back. Tools marks on the wood indicate that the leather was trimmed after being nailed in place. Thus, the condition provides a rare glimpse of the artistry of the carver and upholsterer and the original appearance of one of the most sophisticated seating forms made in mid-eighteenth century Philadelphia. The chair is further distinguished by its ownership in the prominent Powel and Griffitts families of Philadelphia. Close comparison with an armchair at the Philadelphia Museum of Art (fig. 1) reveals they were made en suite, identical in size, material and construction. They also display the same design, although the egg-and-dart shoe carving on this side chair is not present on the armchair. At the time of its publication in 1935, the armchair was owned by a direct descendant of Samuel Powel (1704-1759) and was hailed as “The Samuel Powel Armchair” (William MacPherson Hornor, Blue Book of Philadelphia Furniture (Washington, D.C., 1935), pl. 83). It was Powel’s son of the same name who was Mayor of Philadelphia at the time of the 1776 Second Continental Congress that produced the Declaration of Independence and whose 3rd Street house with elaborate interiors now preserved at the Metropolitan Museum of Art and Philadelphia Museum of Art stood next to the John Penn house, George Washington’s headquarters from November 1781 to March 1782. A matching armchair also without shoe carving at Winterthur Museum provides additional evidence for this history as it descended separately but was still noted to have been owned in the Powel and Griffitts families by the dealer who sold it to Henry Francis du Pont. Six other side chairs from this set are known today (see below) and if the Roman numerals incised on the seat frames correspond to the number of chairs made en suite, the original set comprised upwards of 17 chairs. Of the known survivals, this side chair is the only to retain its original leather seat; it thus reveals the entire set’s upholstery treatment, which may be discernible in period documentation. Samuel Powel’s parlor was furnished with “2 Arm’d red Leather Chairs,” and the 1759 inventory of his widow, Mary (Morris) Powel (d. 1759), includes thirteen leather chairs and two leather arm chairs. Interestingly, one of the listings for the armchairs specifies it was fitted with a cushion. If the maker of the set knew that the armchairs would be used with cushions, it may explain why these forms were fashioned with plain shoes. Alternatively, this side chair may be one of the eight “black walnut” chairs in Mary Powel’s back chamber. Valued at 30 shillings each, these were the most expensive side chairs in the inventory (cited in Hornor, op. cit., caption for pl. 83; “Inventory of the Estate Late of Mary Powell deced,” Philadelphia Wills, Book L, p. 347). Along with the cosmopolitan design, the quality of the workmanship indicates that this chair was made by the city’s leading craftsmen. 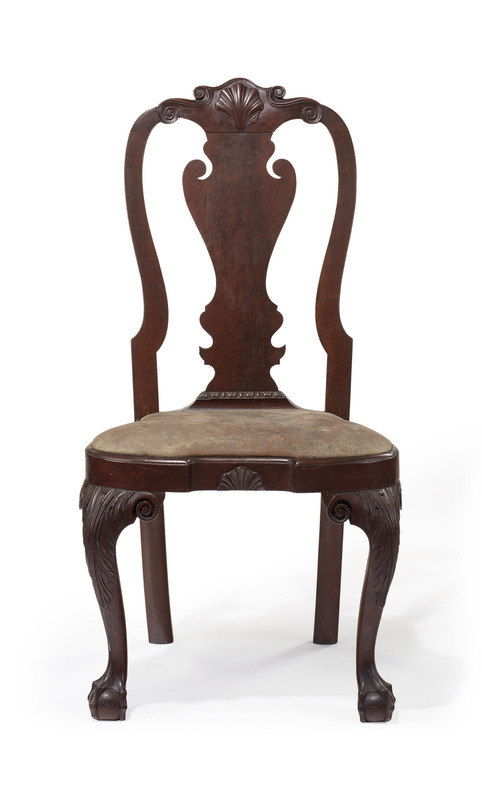 The chair’s feet are slightly underscale and the rear talon has a noticeable knuckle, two features noted by Luke Beckerdite and Alan Miller that characterize ball-and-claw feet made in Philadelphia during the 1740s and early 1750s. Closely related feet adorn forms with carving attributed to Nicholas Bernard (d. 1789), and he, as well as his master, Samuel Harding, stand as likely craftsmen responsible for the chair’s carved ornament. In addition, several high chests and dressing tables with carving possibly by Bernard or Harding display similar knee carving centered by a large triangular gouge and flanked by overlapping acanthus leaves and in his discussion of a chair from the same set as that offered here, Beckerdite describes its knee carving as a “miniature version” of that on these case pieces, while also noting the use of nearly identical knee returns (Luke Beckerdite and Alan Miller, "A Table's Tale: Craft, Art, and Opportunity in Eighteenth-Century Philadelphia," American Furniture 2004, Luke Beckerdite, ed. (Milwaukee, 2004), pp. 8-11, figs. 13, 14, 16, 18; Luke Beckerdite, “An Identity Crisis: Philadelphia and Baltimore Furniture Styles of the Mid Eighteenth Century,” Shaping a National Culture: The Philadelphia Experience, 1750-1800, Catherine E. Hutchins, ed. (Winterthur, Delaware, 1994), pp. 254-263, figs. 9-15, 19. 21). Both Harding and Bernard were among the leading carvers of their day. After this chair was made, Harding carved much of the interior architecture of the Pennsylvania State House, now known as Independence Hall, and, in partnership with carver Martin Jugiez (d. 1815), Bernard fashioned some of the most renowned survivals of Philadelphia Chippendale furniture, including furniture and architectural carving for General John Cadwalader. The chair may have descended along lateral family lines from the Powel and Griffitts families to the present owner, a direct descendant of several of Pennsylvania's pioneer Quaker families brought over by Gov. William Penn to settle colonial Philadelphia and Germantown as well as nearby Chester and Lancaster Counties. The ancestors of the chair’s current owner were allied by marriage to the family that previously owned the pair that sold in the Jeffords sale, the only other side chairs from the set with any family history. The last family owner of the Jeffords Collection chairs was Dr. Everett Pusey Barnard (1875-1957), whose brother Henry Walter Barnard (b. 1873) married Ella Sidney Cooper (b. 1876), the sister of Milton Conrad Cooper (1865-1961) (fig. 3), who was the grandfather of the consignor of the chair in the current lot (Truman Coates, A Genealogy of Moses and Susanna Coates (1906), p. 72; John Franklin Meginness, Biographical Annals of Lancaster County, Pennsylvania (1903), p. 570). With similar losses to the shells on the front rail (those on the Jeffords Collection chairs were later repaired) and complementary frame and slip-seat numbers on the chair offered here and that in lot 218 in the 2004 sale noted below, it is very likely that the three chairs had a shared history in the nineteenth century. This history probably included earlier descent along Barnard family lines, as the consignor recalls that Dr. Everett Pusey Barnard had tried to acquire this chair from his grandfather believing it had come from the Barnard family. The Barnards were related to the Griffitts as Dr. Barnard’s grandfather, Pusey Barnard (1810-1884), was the third cousin of Ellis Lewis (1798-1871) who married Hester Griffitts (b. c.1795), the great granddaughter of Samuel Powel (1704-1759) (John W. Jordan, ed., Colonial Families of Philadelphia, vol. 1 (New York, 1911), p. 113). On its own, this distant family connection does not seem a likely route for the descent of the chair, but other family ties or perhaps geographic proximity may have caused a lateral descent at some point in the nineteenth century. Known chairs from the same set comprise the armchair at the Philadelphia Museum of Art (fig. 1), an armchair at Winterthur Museum (Joseph Downs, American Furniture: Queen Anne and Chippendale Periods (New York, 1952), no. 30), a side chair at the Henry Ford Museum (fig. 2) and five chairs owned privately (a side chair marked X and I, Christie’s New York, 25 September 2013, lot 7; a side chair marked XVII, Israel Sack, Inc., American Antiques from Israel Sack Collection, vol. 5, pp. pp. 1220-1221, P4161, same chair illustrated in Beckerdite 1994, cited above, figs. 19, 21 and Joseph Kindig, The Philadelphia Chair, 1685-1785 (York, Pennsylvania, 1978), no. 66; David Stockwell, Inc., advertisement, The Magazine Antiques (October 1973), p. 497; a pair of chairs, marked II with seat VIIII and X with seat X respectively, Sotheby’s, New York, The Collection of Mr. and Mrs. Walter M. Jeffords, 28-29 October 2004, lots 218, 219). Based on photographs, the dramatic graining on the splat of the chair offered here appears to match that on the chair at the Henry Ford Museum (fig. 2), indicating they were cut from the same flitch of wood. Christie’s would like to thank Alexandra Kirtley, The Montgomery-Garvan Curator of American Decorative Arts and Chris Storb, Dietrich Foundation Project Conservator at the Philadelphia Museum of Art for their assistance with the preparation of this essay.